If you’re a parent, then more than likely, you’ve assembled a child’s toy. If you’re reading this, you lived through it. Typically, toys come with instructions written by somebody somewhere whose job it was to build the toy and painstakingly communicate—step by step—precisely how they did it. This is meant to help me. And I’m sure the intentions behind the pictures and numbered steps and labeled parts and phrases like, “Put part B into part A using nut D and bolt C,” are noble and kind. But they are as clear as mud! You know what I’m talking about. 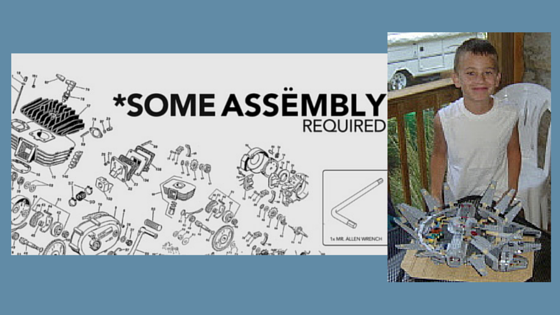 Let me assure you that starting a Q Place is far simpler than assembling one of those toys! There are just four stages: Preparation, Invitation, Trial Meeting, and Growth. In the Preparation stage you will find two partners who are followers of Jesus, who share your desire to see friends find Him. As an initiator triad, you will pray and prepare together to love the people who will be in your group and to ask questions rather than correct or lecture. You’ll also prayerfully create a list of people to invite and plan the logistics for the Trial Meeting. In the Invitation stage, you will simply invite people to the first meeting. The invitations are straightforward, not a bait and switch. The purpose of your group is to have spiritual conversations about God and the Bible, and you would like the friends you are inviting to come because you believe that each of them would be a valuable contributor. Your triad will continue to pray and support each other as the invitations are weighed and considered. Now it’s time for the Trial Meeting, where you will ask this question, “If you could ask God one question, and you knew He would answer, what would you ask Him?” Responses to this question will reveal the spiritual matters that your friends are willing to discuss. Your triad will listen carefully to the responses and then suggest meeting again to discuss the questions that were brought up. After the Trial Meeting, you have made it to the final stage: Growth. 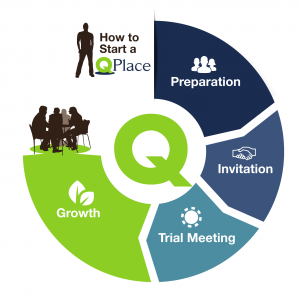 In that stage, your group can use a variety of Q Place’s inductive, discussion-generating materials to explore the questions brought up in the Trial Meeting. Scripture comes into the conversation at an amount and pace that fits the readiness of the group. There are Guidelines that the group agrees to follow so that everyone can discuss and make discoveries together—and there are many, significant discoveries! Your triad will continue to pray that God will use His Word through your discussions to help participants make the ultimate discovery—Jesus and His offer to them. Starting a Q Place is not complicated. But the simplest way to find out? Just start to assemble—no pun intended. The Worst Q Place Ever?